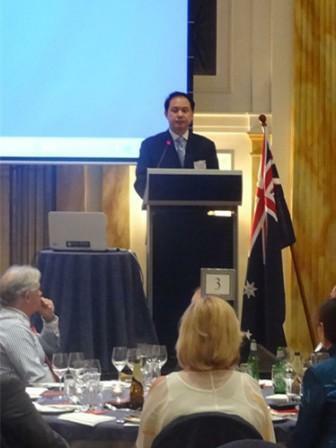 On Feb. 10, Chinese Consul-General Zhao Yongchen attended the 2014 Business Forum Dinner Banquet hosted by Australia-China Chamber of CEO (ACCCeo) and delivered a keynote speech. The Hon. Gavin King, representative of the Premier Campbell Newman and Assistant Minister for Tourism, Mr. Mark Jamieson, Mayor of Sunshine Coast, Ms. Pam Parker, Mayor of Logan City, and Cr. Steven Huang, representative of the Lord Mayor of Brisbane also addressed the function. Consul-General Zhao spoke highly of the outstanding achievements in China-Queensland trade and economic cooperation, appreciated the arduous efforts made by Chinese investors in Queensland and extended his sincere thanks to Queensland State Government and City Councils as well as NGOs including ACCCeo for their great support. Consul-General Zhao called on both sides to seize the G20 opportunity to push the bilateral trade and economic cooperation to a new level.